“I know what its like to hear that you can’t use a certain road or pass through a checkpoint because you are a Palestinian. I know what it is like to feel discriminated against and powerless,” Rice told a closed meeting of Arab and Israeli representatives, according to the Dutch representative at the summit, Franz Timmermans. Your implied analogy between Palestinians and black Americans in the segregated South is so bad that I cringe. Can you honestly compare institutions segregated because of groundless racial prejudice with checkpoints at which terrorists carrying bombs are stopped on a regular basis? Can you honestly compare a fence to keep terrorists out with restrictions on where blacks are permitted to live? Can you honestly compare the fate of a Hamas rocket squad hit by the IAF with that of the civil rights workers who were beaten with chains and shot to death in Mississippi in 1961? Can you honestly compare the great Dr. King with the abominable Yasser Arafat? How can you insult the massive numbers of nonviolent blacks who protested and demonstrated against segregation, exposing themselves to beatings, jailing and even possible murder at the hands of the Klan and racist local police (often one and the same) by comparing them to Palestinians, who either directly carry out terrorist acts of murder and mayhem or, in large majority, applaud those who do? The Palestinian Arabs, with the military, diplomatic and financial backing of Iran, Syria and Saudi Arabia, refuse to agree that Israel has a right to exist as a Jewish state, refuse to stop terrorism against it, and insist that Israel accept almost 5 million hostile Arabs. How is this in any way parallel to the struggle of American blacks to end segregation and discrimination? 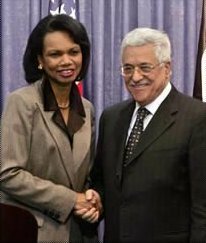 There is no parallel, Ms. Rice, except in the doubletalk of the Arabs and their friends, and the media fakery that creates massacres and murders where there aren’t any. And then these non-massacres and non-murders are used as incitement to lynch — you are familiar with this concept? — innocent Israelis. You have it backwards, Ms. Rice. Cardinal Renato Martino, who heads the Vatican’s office for migrants, said an agreement to restart peace talks, reached Tuesday in Annapolis, Maryland, was encouraging and that he hoped by this time next year concrete measures would be under way. The war which created the refugees was started by the Palestinian Arabs and their allies and was the culmination of a campaign of terrorism and pogroms against Jews in Palestine since at least the 1920’s. There were at most 700,000 Arab refugees (probably less). The Palestinians are demanding that almost 5 million descendants of these ‘return’ to Israel 60 years after the war (the Jewish population of Israel is about 5 million). During and after the War of Independence, about 850,000 Jews were expelled from or fled their homes in Arab countries, in most cases leaving all of their property behind. These Jews were absorbed by other countries, most of them going to Israel. Do not their descendants have a claim on the Arab world? The Arab nations hosting the Palestinian refugees refused to absorb them, and a special UN agency (UNRWA) was created just for them. The normal UN refugee agencies were not used, because they are concerned with finding homes for refugees. UNRWA’s job has been to keep them in camps and on welfare in order to nurture a hostile population to be used as a source of anti-Israel soldiers and ultimately as a demographic weapon. Some UNRWA personnel belong to terrorist organizations, such as Hamas. When Jordan occupied the West Bank and East Jerusalem in 1948, the areas were ethnically cleansed of Jews, who fled or were murdered. The Palestinians are demanding that all Jewish settlements be removed from what is to be their state. Yet they expect Israel to absorb an additional 5 million Arabs! If Israel were to agree to this, it would immediately have an Arab majority and would cease to be a state of the Jewish people. But the Palestinians insist that they must have a state because they have a right to self-determination. Apparently, they do not think that the Jewish people has this right as well. Practically speaking, the influx would result in immediate civil war, which would make similar wars in Lebanon and Yugoslavia look like ping-pong tournaments. Cardinal Martino, ironically, is President of the Pontifical Council for Justice and Peace! He is also President of the Pontifical Council for Pastoral Care of Migrants and Itinerant Peoples. One would think that he might have some understanding of the prototypical “Itinerant People”, who have finally returned home after thousands of years. Balad is an Israeli political party with an Arab nationalist point of view. Yes, that’s correct. Since Israel is a democracy, Arab citizens of Israel can vote for an Arab nationalist party (Jews can, too, for that matter). The Balad council decided to urge the Palestinian negotiating team in Annapolis not to make concessions that could harm the rights of the Palestinian people, and especially not to give in to the Israeli demand to recognize Israel as a Jewish state. The Balad council also sent messages to the Israeli delegation to Annapolis to help the Palestinians. I have pointed out before that there is a difference between protection of minority rights, in such areas as of public services, education, housing, employment, etc., and providing for the fulfillment of national aspirations of minorities, and that a democratic state is only required to provide the former. Israel’s very reason for being is as a homeland for the Jewish people, with the special character that this implies. Certainly the Palestinian state that Balad wishes to see established in the territories will be a state of the Palestinian people, with appropriate symbols and character. If these things are not important to the Palestinians, why do they want a state? Why won’t they be happy living in Israel, Jordan, etc.? They really can’t insist on self-determination for Palestinians while denying it to Jews. We Jews can certainly sympathize with Balad, whose members apparently feel that they have some important needs which cannot be met when they live in a country whose national anthem is Hatikva. Jews, at least Zionist ones, understand why a people needs a state. The thing is, this issue was settled in 1948. There is a Jewish state whose anthem is Hatikva. There could have been a Palestinian Arab state then, or in 2000, had they wanted it more than they want there to not be a Jewish state, but apparently this is not the case. The Palestinians, inside and outside of Israel accept that a state of the Jewish people was established in 1948, and decide to create a Palestinian Arab state outside of it instead of trying to reverse the outcome of the war. The Arab world succeeds in destroying the Jewish state, and the Palestinians establish their state on the wreckage. There is a war which includes the use of weapons of mass destruction. Tens of millions are killed, mostly on the Arab side. The entire region descends to a pre-civilized level. Because of the effect on the oil supply, the rest of the world also changes drastically. The problem is that the Palestinian and Israeli Arab leadership and intelligentsia think that they do not have to take no. 1, because they can get no. 2. They are encouraged in this by Iran and Saudi Arabia, who are vying to be the ones to solve the Jewish problem. But they cannot get no. 2. Trying too hard will only get them no. 3. Maybe the rest of the world, which has an interest in avoiding no. 3, should explain this to them. The Annapolis Conference which is taking place as I write this is presented as a start toward solving the Israeli-Palestinian conflict (it was originally intended to be more than just a start, but it quickly became evident that this was unrealistic). I’ve argued that Israel and the Palestinians are now almost irrelevant to the conference, whose real purpose is to help the US get concessions from (primarily) Saudi Arabia and Syria regarding Iraq. So the Israeli right wing opposes the conference because it fears that some of these concessions will be paid for with Israeli coin, and Hamas opposes it because they will weaken its patron, Iran, which is happy to see the US stuck in the Iraqi sand. But it’s unlikely that this gambit is going to help the US, either. Here’s why. Get Arab and European support for solving the Iraq crisis. Mobilize Arab and European forces against a threat led by Iran and its allies, Syria, Hamas, and Hizballah. Get Iran to stop its campaign to get nuclear weapons. Reestablish American credibility toward friends and deterrence toward enemies. Reduce the level of Israel-Palestinian conflict. That pretty much describes the U.S. framework for dealing with the Middle East nowadays. The Annapolis conference is not going to contribute to these goals. The most likely outcome is either failure or a non-event portrayed as a victory because it took place at all. No one is going to say: We are so grateful at the United States becoming more active on Arab-Israeli issues that we are going to back its policy on other issues. On the contrary, the conference is more likely to show the inability of the United States to produce results, thus undermining belief in U.S. leverage in the region in general. It shines the spotlight on the most divisive issue, the great excuse for not doing more to help U.S. efforts, raising its prominence. What most of Washington simply fails to understand is that any real demand for Palestinian or Arab concessions will be fodder for radical groups and frighten Arab regimes, pushing the latter away from support for America rather than toward it. And any Israeli concessions obtained by this process will not satisfy their demands either. Despite thousands of claims by lots of famous people, national leaders, and respected journals, solving the Arab-Israeli conflict will not make radical Islamism or terrorism go away. Would you like to know why? Because even if this issue could be solved — which isn’t about to happen for reasons requiring a different article — to do so would necessitate a compromise including an end to the conflict, acceptance of Israel, and compromises by the Arab side. These steps would inflame the extremists and make any Arab rulers who accepted it vulnerable to being called traitors. It would increase instability in the Arab world, also by removing the conflict as splendid excuse and basis for mobilizing support for the current rulers. Arab politicians understand this reality; most people in the West don’t. Such considerations are accurate analytically but the conference will take place anyway. It has been reinterpreted by the U.S. government as the opening of a long-term process rather than its culmination. The analogy is to the Madrid meeting of 1991 — which started a nine-year-long failed peace process — rather than to the Camp David summit of 2000, which marked its breakdown. Given the fact that the meeting is going to take place, and one would like to see as little damage result as possible, what is the worst mistake that could be made to ensure that an already difficult situation becomes worse? Answer: invite Syria. Let’s remember a few things. The meeting was called to deal with the Palestinian issue. Bringing in the Syrian question is going to destroy that focus. Palestinian leaders know this to be true and no doubt are horrified by Damascus getting equal time. But that’s just the start of the problem. Run your eye back up the page to the five points listed as priorities for U.S. policy. Iraq? Syria is the main sponsor of the terrorist insurgency. It has a deep interest in ensuring that no moderate, stable, pro-Western regime takes root in Iraq. The radical alliance? Syria is a leading factor in the problem, a partner with Iran for twenty years. Anyone who believes that Damascus can be split from Tehran understands nothing about the mutual benefits Syria gets from the alliance, far greater than anything the West could possibly give to its dictator President Bashar al-Asad. Iranian nuclear weapons? When Iran gets atomic weapons it will be a great day for Syria, ensuring its strategic protection, damaging Western influence, and helping the radical Islamist cause that Syria backs. American credibility? It undermines years of U.S. efforts to pressure Bashar away from radical adventurism. Syria can now show that it can kill Americans soldiers in Iraq, murder democratic Lebanese politicians, foment Hamas’s takeover of the Gaza Strip, and sponsor Hizballah’s effort to seize power in Lebanon without incurring any serious risk or cost. On the contrary, Syria is now making demands on the United States for concessions in order to entice it to show up. This is happening at the very moment when plans for an international trial of Syrian leaders for political assassinations in Lebanon is gathering momentum, as Syria’s campaign to install a puppet government in Beirut has just been foiled. Is the conference’s purpose, however ill-conceived, to make progress on Arab-Israeli peace and strengthen the Palestinian Authority? Having Syria present lets in the main Arab sponsor of Hamas, a state working tirelessly to throw out the current Palestinian leadership and raise the level of Arab-Israeli violence.